January’s meeting was a joint meeting with the Association of Energy Engineers and the Connecticut Green Building Council on the topic of Energy Star & Energy Simulation Aided Design for Buildings. Our dinner speaker, Sara Lisauskas, gave an excellent talk on the Energy Star Portfolio manager. This month’s speaker is on Health and Humidity and looks to be very interesting. ASHRAE had their winter meeting in Atlanta in January. The meeting was 2 weeks before the Superbowl will be in there so there was a lot going on in the city. There’s a lot going on with ASHRAE as well. The headquarters were sold to the local hospital who have wanted the property for a long time. ASHRAE purchased a new property that is twice the space and on ten acres of land. They plan to renovate the building and have a state of the art Net Zero building. This will take some doing and ASHRAE has set a budget of 15 Million to get this done. This is expected to cause a budget short fall in coming years. At the technical committee meetings, along with the normal committee work there was discussion about consolidating committees. Each committee was asked to suggest other committees that they could be merged with. The hope is by having less committees they will not need as many meeting rooms. This will same money and will open up the ability to look at other cities for the winter and summer meetings. We sent Justin Simko a U-Hart student chapter member to the winter meetings. Please look for his report elsewhere in this newsletter. It was good getting together with him at the region 1 dinner and introducing him to some of the regional officers. Justin got together with other members of our board and attended TC meetings as well as educational seminars. Looking forward to seeing you all at the next meeting. Description: The purpose of this course is to provide each participant with the basic knowledge and skills needed to understand and design humidification systems. We will discuss common components, types of humidifiers, typical applications and design concerns, specification concerns, and some pitfalls that are all too common. We will also discuss the importance of water quality and the treatment options that are available. Lastly, we will review control strategies that work and the ones to avoid. Description: The purpose of this presentation is illustrate why humidification is so important to human health. We will discuss how humidification can affect wellness, patient HAI’s, and flu transmission. We will also touch on the systems available in the humidification market and on some of the codes that govern the applications and some resources that are available to you. Mr. Bennett has been in the HVAC industry for over 20 years. His background includes experience as a contractor, manufacturer’s rep, and as a manufacturer regional manager. He has a worked on and designed a wide range of systems including hydronic heating and cooling, air distribution, electrical, plumbing, refrigeration, building controls, and humidification. ASHRAE offers HVAC Design: Level I – Essentials March 11–13 and HVAC Design: Level II – Applications March 14–15 at the Marriott Hartford Downtown, 200 Columbus Blvd, Hartford, Connecticut. ASHRAE’s HVAC Design: Level II – Applications training provides participants with instruction on HVAC system design. The training is tailored for engineers with advanced experience in the HVAC design field, or those who have completed HVAC Design: Level I – Essentials. Developed by industry-leading professionals, the training provides advanced information that allows practicing engineers and designers an opportunity to expand their exposure to HVAC systems design procedures for a better understanding of system options to save energy. YEA Wolfpack Hockey Networking Night! Get out of the office and join YEA for a night of hockey and networking. The night will begin at City Steam Brewery from where we will continue to watch the Hartford Wolfpack play the Hershey Bears! We are also being treated to a behind the scences tour of the ice chilling equipment during an intermission. The $30 ticket includes (1) beer at City Steam Brewery and a Wolfpack ticket along with the tour. 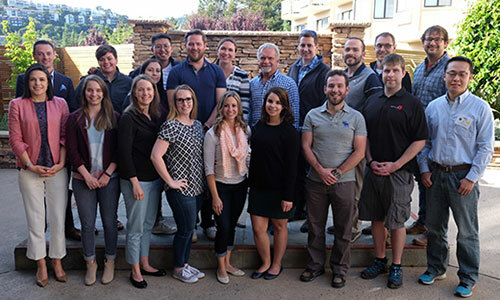 The Young Engineers in ASHRAE (YEA) Committee enhances member benefits for young professional ASHRAE members, 35 years old and younger, by identifying activities and services focused on their needs. 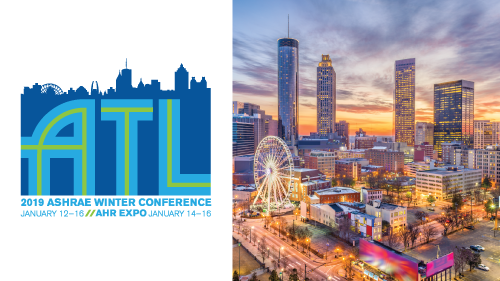 Join us at the Winter Conference in Atlanta to meet your YEA Representatives! This event is open to any current ASHRAE member who has previously attended a YEA Leadership Weekend event and has not already attended YLW 2.0. Attendance is limited to 20 people and registration will be filled on a first-come first-served basis. Registration will open on Monday, September 24, 2019 at 12:00pm/Noon Eastern. 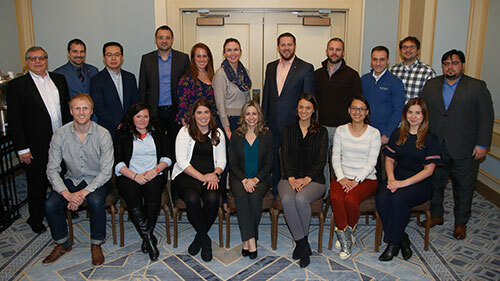 The conference started with the student program at the Omni hotel in downtown Atlanta Georgia with a greeting from ASHRAE president Shelia Hayter, where she spoke about her involvement with the organization and her contributions as a student to initiate the student program. Recipients of last year’s grant program presented their work on a dual use high efficiency variable speed dehumidifier, which was an insight into the level of quality the organization supports. A presentation from NASA researcher Dr. Christine Darden followed with her research in supersonic flight and sonic booms, which after forty years is now being used to develop new aircraft for commercial use by Lockheed Martin. Dr. Darden’s talk was inspiring to hear about how she had to overcome many obstacles in her life and always persisted to achieve more no matter her circumstances. Succeeding the presentations, the student program hosted multiple events providing the opportunity to learn more about other student branch chapters in the country as well as encouraging students to attend technical committee meetings the over the course of the conference. The student program did a great job at explain the conference structure and how each committee and seminar worked, as well as providing information on how to attend technical sessions if desired. Saturday evening the welcome party was held in the great hall of the Fernbank Museum of Natural History around some of the world’s largest dinosaurs. It was an incredible opportunity to meet some of the long-time members of the organization and to connect with other student members across the world. Sunday’s activities started with a hands-on design challenge with fellow students followed by a technical presentation by Dr. Nadia Sabeh on her career in combining Agriculture and Mechanical Engineering to better design HVAC systems for indoor facilities including vertical farms, and greenhouses. Her presentation included views on sustainable farming as well as its long-term impacts on providing food resources to the world. A tour of the active construction site at Georgia Tech’s new Kendada building followed the presentation. The project aims to become the most environmentally advanced educational and research building ever constructed in the Southeast by meeting some of the highest building performance standards in the world. The building will produce more energy than it uses with its 328 kw Photovoltaic array on the roof, and will treat and reuse all the water collected on site in its 50,000-gallon cistern tank. This project aims to achieve the most rigorous benchmark of sustainability in the built environment, the living building challenge, it is self-sufficient while using zero red listed materials in order to create a positive impact on the surrounding human and natural systems. The photo below shows the project and upper deck made of its salvaged two by sixes from nearby Atlanta studios that were scrapped after the deconstruction of film sets. As a student interested in renewable energy and sustainable design this was an incredible way to understand some of the challenges in implementing these principals into practice. Also attending a technical newly offered technical session on solar pv and thermal system analysis and design provided insight into the tools used by industry professionals to create sustainable building systems. The experience overall was an incredible way to have insights into how the industry as a whole function. Being able to attend technical sessions and learn new material that is used by practicing engineers was invaluable. Also, the expo provided exposure to the most common and new systems that are being used to achieve better designed buildings in all different size projects. I am grateful for the experience and want to thank CT ASHRAE and the Student Activities Committee for sponsoring me to attend the conference. For over a year, Dr. Ravi Gorthala, chair of mechanical and industrial engineering at the University of New Haven, has been leading a project on field demonstration of Fault Detection and Diagnosis (FDD) technologies for retro commissioning and continuous commissioning of HVAC&R systems. This $1.2 million dollar, three-year project is funded by the U.S. Department of Energy’s Office of Energy Efficiency and Renewable Energy (EERE) with cost sharing from United Illuminating (Avangrid) and Eversource through funds from Energize CT, University of New Haven and UCONN. UCONN’s UTC Institute for Advanced Systems Engineering and United Technologies Research Center (UTRC) are the subcontractors on the project. Dr. Amy Thompson is the lead for the UCONN’s subcontract and Dr. Timothy Wagner is overseeing the UTRC’s efforts. Amy Jiron is the DOE project manager and has been championing other FDD projects as well as Energy Management and Information Systems projects. Several undergraduate and graduate students from the University of New Haven and UCONN have been working on this project. Currently, Annika Hacker, a graduate student in mechanical engineering is the student lead with technical and logistics support from Prathamesh Patil and Surya Vadali (graduate student) of Tagliatela College of Engineering at the University of New Haven. Also, Irmak Atilla interned for over two months on the project. Mohammed Albayati, a doctoral student from UCONN, has recently begun working on this project under Dr. Thompson’s supervision. This project is offering students a real-world, hands-on education and challenging them on serval fronts. Students have been reviewing various FDD tools and their capabilities, developing selection criteria, designing and acquiring the instrumentation and data acquisition systems for independent monitoring of the FDD tools. Students are also in the field on rooftops auditing the Rooftop Air-Conditioning Units and pre-testing them. They are working with the HVAC technicians, facility managers and organizing outreach events and so on. As a part of this project, students will be working with HVAC contractors in installing the FDD tools at ten different sites and monitoring and evaluating their performance for over two cooling and heating seasons. Overall, this is a rewarding experience for the students. Additional information on this project can be found at https://www.unewhaven-doe-fdd.com/ or by contacting Dr. Gorthala (rgorthala@newhaven.edu). The 2019 ASHRAE Winter Conference took place Jan. 12-16 at the Omni Hotel Atlanta at CNN Center and the Georgia World Congress Center in Atlanta, Ga, ASHRAE's headquarter city. More than 2,700 individuals registered for this year's Winter Conference. The Winter Conference technical program featured more than 300 presentations, with interest surrounding this year's new track, Renewable and Natural Systems, where session topics included exploring energy technologies, renewable energy sources and the future of the smart grid. At the conference, Hayter provided Society updates and initiatives related to the Society theme, "Building Our New Energy Future." She focused on how ASHRAE is preparing buildings professionals for the challenges and opportunities of designing efficient and grid-responsive buildings within the changing energy sector. Hayter announced that a workshop, Building our New Energy Future: Current and Emerging Research Priorities, will be held Feb. 4-5, sponsored by NREL and ASHRAE. Also announced was the release of a presidential webinar, titled "Efficient Buildings, the Future and a More Intelligent Grid." During the conference, ASHRAE signed a Memorandum of Understanding (MoU) with the Pakistan HVACR Society (PHVACR). The agreement formalizes the two organizations' long-standing commitment toward the promotion of common cooling and heating related endeavors. "The mutual benefit of the new work plan is that ASHRAE has the ability to make key experts in refrigerant development and the application of new refrigerants accessible to UN Environment, through ASHRAE chapters to provide training to national policy makers and practitioners in developing countries," said Hayter. "As the world shifts to use of refrigerants with lower global warming potential, mandated by the Montreal Protocol, the linkage between ASHRAE and UN Environment's OzoneAction unit is critically important to meet global challenges."